Getting hold of a plinth is as easy as going to a timber yard and buying a length of 35x35 or what ever size you need and cutting it to length (you can even get them to do it for you). You can add a beading to it also if you are keen. Or you can purchase one from a retailer. Sockelmacher comes to mind. 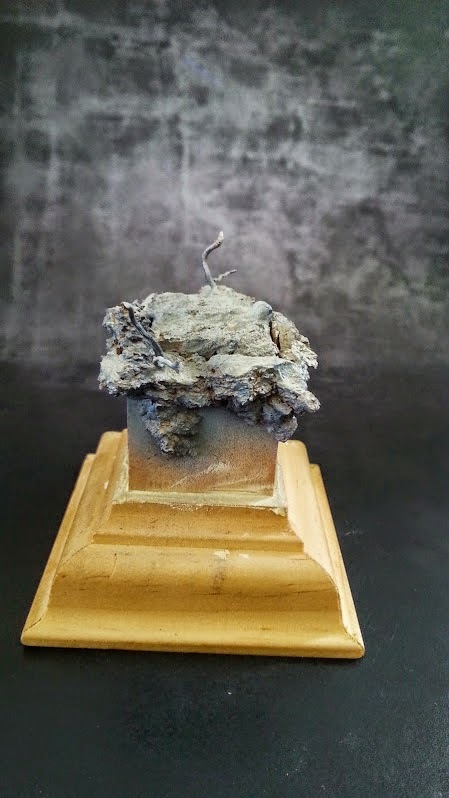 On this base I have used cork. Your local hardware store should sell cork tiles, this is what I have used. A lot of people use corks as slabs of earth to get a base, this has its uses. 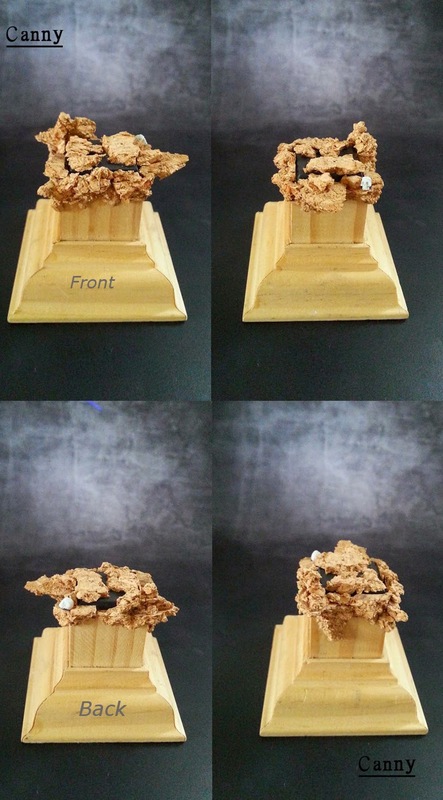 To get a better looking base, and to avoid the "oh I can see that's cork" break your cork up into pieces and glue it on making it more irregular. Adding a few items of interest always helps if you are planning a larger base, here I used 2 skulls. 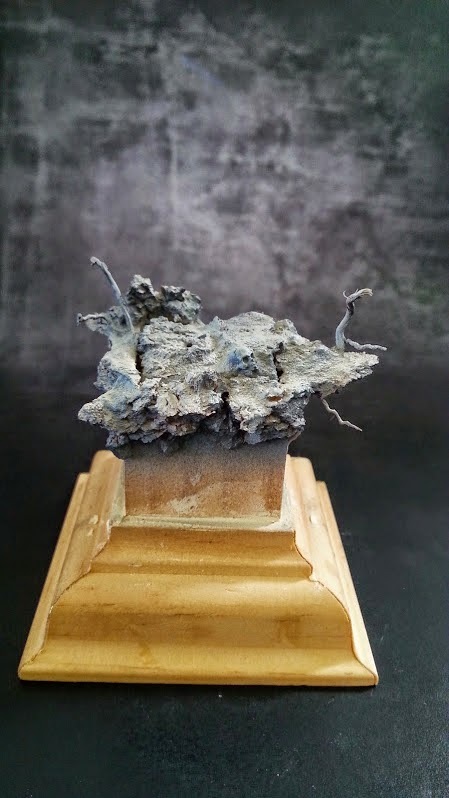 I have used a bit of blue tack and set the removable base in the centre of the plinth and used the cork to surround it and build an enviroment. Think of the cork as volume and the "rocks" to form the general shape of the scene. 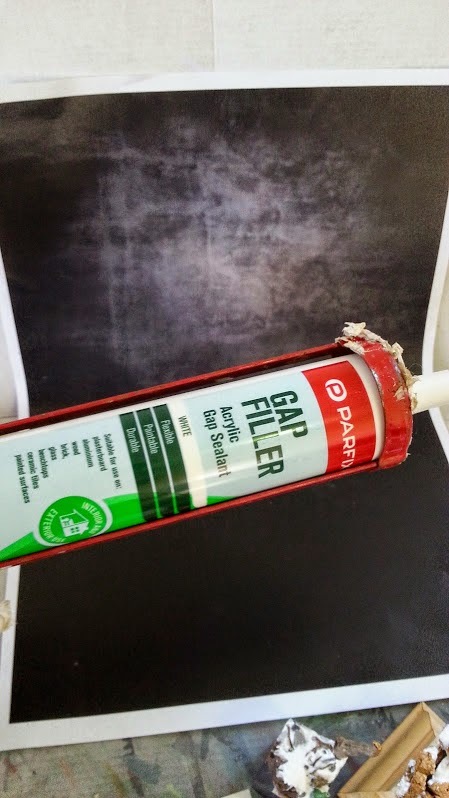 Next also from the hardware store is gap filler was just under $4. 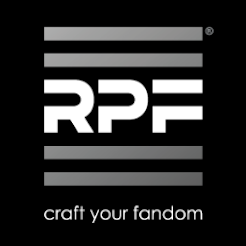 Its a perfect option for those who don't feel the need or have the funds to purchase products that are 4x times price. An old brush that is at the end of its days is great with a bit of water to sculpt the filler too. Squirt it on to the base and a little to the side use your modelling tools and brush to move it around and squash it in to any gaps that don't look right. 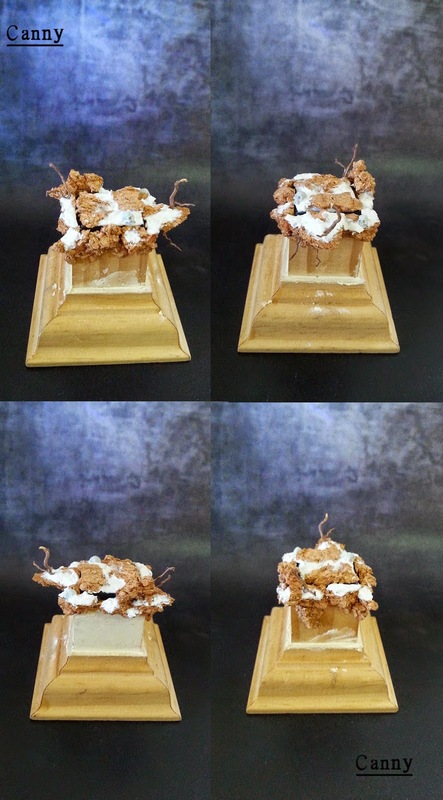 My thoughts are to build some more volume and give a base to the area I will cover with sand and baking soda. I want to use baking soda as the grain is much smaller and I want to create a dusty looking enviroment. while the filler was drying I selected a few pieces of root that I had collected in my travels stuck them in so the filler would harden around them. 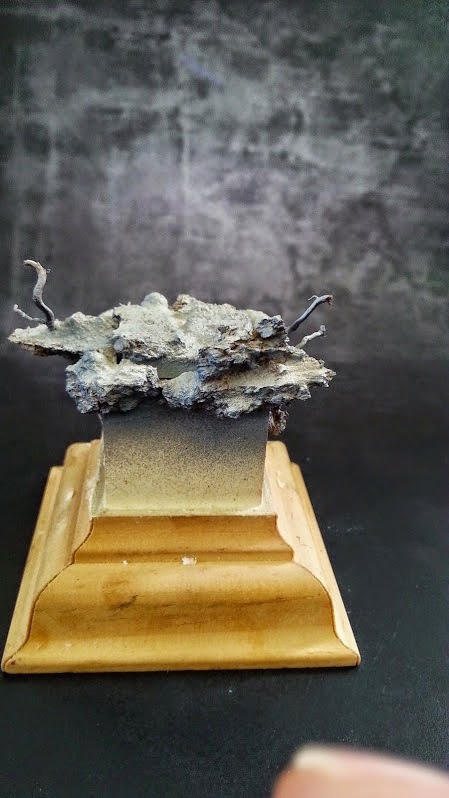 Using a smaller piece of root I glued one to the underside of the small cliff so the dead tree above had some roots too. The next step I added baking soda to the filler areas and a few smaller areas. I brushed the residue off the base as I'm looking for a dusty desert look not soft snow. I have primed the base using black and grey primer, black from below and grey from above, there is a slight khaki colour to the grey as I added it to the grey primer just as an experiment. 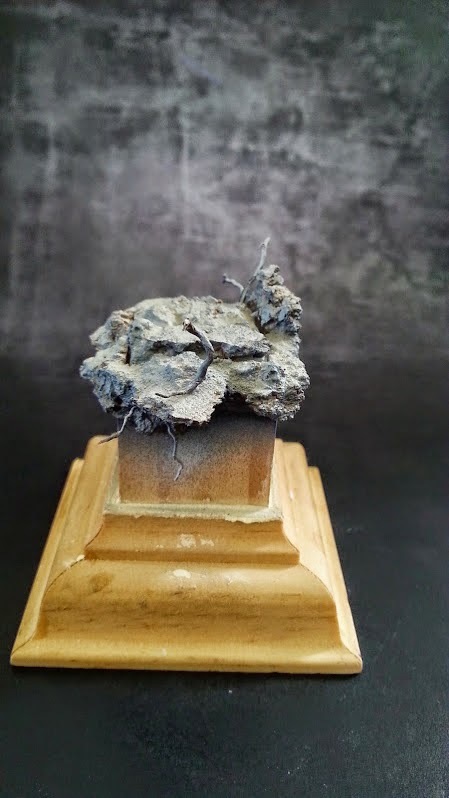 Here you can start to tell that this looks like an realistic enviroment, it is harder to make out a slab of cork the top ground undulates more than if it was a flat piece of cork and its smooth enough to look like a dusty desert. I hope you have enjoyed this little voyage into base building and if you have any questions don't hesitate. Painting and pigments are the next step and 3 special additions for interest.